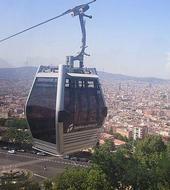 Ride on the Montjuïc Cable Car and see the attractive sights of Barcelona. Come to the Castle of Montjuïc and get on the Montjuïc Cable Car nearby to enjoy fantastic views over Barcelona that you've never seen before! Because of the long queues it is recommended to buy your tickets here in advance! • January to February: 10 a.m. - 6 p.m.
• March to May: 10 a.m. - 7 p.m.
• June to September : 10 a.m. - 9 p.m.
• October : 10 a.m. - 7 p.m.